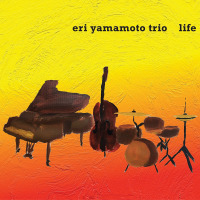 Eri Yamamoto’s pianism is quietly dignified and her approach to music making exudes introspection and beauty. 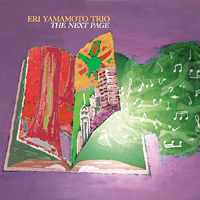 Each note seems sculpted out of the silence surrounding it, making this latest trio disc a pleasure. Yamamoto can certainly play ‘out,’ but her subtle exploration of the symbiosis of mode and chord places her apart from the firebreathers. The wistful homophony of “Dear Friends” references gospel, blues and chorale while never quite conforming to any of those stylistic tropes. “Wonder Land” exists on a similar plain, but counterpoint renders harmonic concerns suggestive and mysterious amidst the tune’s propulsively funky rhythms. 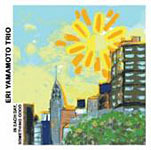 Bassist David Ambrosio and long-time drummer Ikuo Takeuchi support Yamamoto’s musings with conviction and just the right level of robustness. Such verbal simplifications and explications do nothing, however, to explain the complexities in “Bumpy Trail,” the melody as thorny as the title suggests. 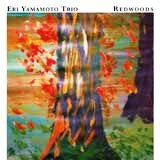 Ambrosio and Takeuchi sputter and rock, providing their own counterpoint throughout the head, and lay back as Yamamoto stretches out, spinning melodic sequences in both hands with bluesy inflections to fill out the webs of intrigue she’s constantly spinning. “Bumpy Trail” also demonstrates that she is never averse to repetition, as illustrated by some well-timed G-inflected passages of fiery blues. All that builds to a solo from Takeuchi that blends control and enthusiasm, his sense of melody and love of timbral diversity informing every gesture of his brief but potent exhortation. As with everything Steven Joerg’s label releases, the sound is first rate. 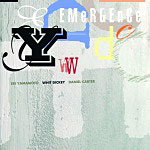 This is a brilliant followup to Duologue, Yamamoto’s series of duets for the same label, and a worthy addition to her trio’s catalogue. Track Listing: This Is An Apple; Wonder Land; Bumpy Trail; Redwoods; Bottled Water Princess; Magnolia; Story Teller; Dear Friends.